I have just joined the gym at work, I deliberated about it for a while but it’s £14/month and I can get into the gym 5 mins after leaving my desk, so no excuses right?! Ha, yesterday I couldn’t go as I forgot my towel – What would you have done? I have managed to chat to one of the resident PTs, Matt and he has put together an amazing programme for me. He totally listened too, I said I would get bored, so rather than giving me one, he’s done me two programmes, one for a Tuesday and the other a Thursday. The equipment in the gym is fab, SRU have a partnership with Edinburgh Napier, as do many other sporting associations, this means that the kit in the gym is up to date and loads of it. The down side is training alongside people who are fit, and I mean really fit! So how do you motivate yourself to keep going, what I have realised from Grim’s fitness regime is that it’s about consistency – Not how much you do, but just keep doing it. Of course calories in, calories out is a factor, but keep doing it. My motivation is seeing how well he has done and he looks fab! Right so that’s me, I’m on the wagon…. 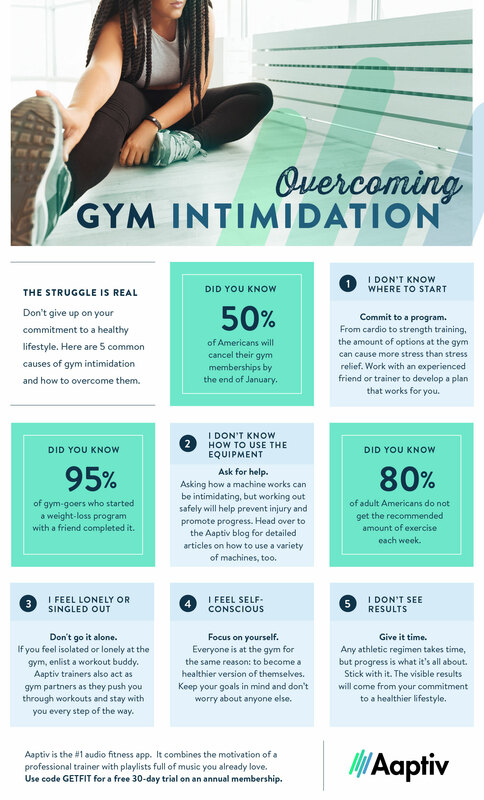 So what can you do to get over your gym intimidation? I came across this infographic, now I know that it’s American stats, but seriously, these apply here too. How many people joined a gym in January and are no longer committed to it? How many people make excuses for not going? Yes, I know I have done it too, but I really do think that some ideas that are in this infographic are fab. Like getting fit with a friend – This really does work especially when you worry that you are letting them down if you don’t go! You could also download the Aaptiv App. If you want to find out more about about Aaptiv the motivation app, then visit their website to find out more and how to get your 30 free trial.